Vokos had picked up the trail. It was easy for one such as he. He sent one of his brothers back to the gate to inform the Master. It was not long before the others joined him. He tried to stay back out of ear shot, a difficult task given that one of the prey was an elf. It was made easier when Jolenta arrived. She told him that the Master would give the signal to attack and then she cast an incantation of silence, allowing them to creep close to their quarry. Already fully transformed, he had to concentrate fully on keeping his composure as the bloodlust grew inside of him and his brothers. The screamed command from above startled the dwarf. He heard Miklos cry out but it all seemed distant and far away and as there was nothing he could do for Miklos at the moment. The yellow robes from above made too tempting a target and the dwarf fired off his crossbow bolt towards the cowardly mage. “Hasan, can you return the sentiment?” the dwarf called out as he switched over to his battle axe. Hasan grinned at Feldard’s crack and directed his own arrow at the marauding mage. He had expected to see him aloft upon Cardia’s Carpet, but the mage was flying via his own spell, as he had when he had fled from the tower in Xitaqa. The arrow flew fast and true, slicing through the mage’s robes. He shouted in pain, and then quickly flew out of range. Hearing Golthar cry out, Ludo had ducked and waited for what seemed like eternity for oblivion. Then, realizing he was still alive, he stood up, and waited for the charge of his enemies. He knew this would be fight to the death. The first to emerge from the brush were a pack of four rat creatures. 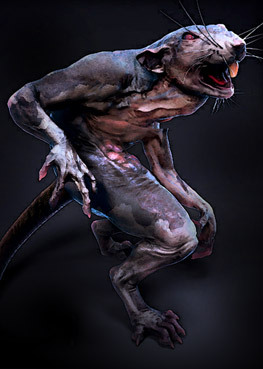 Stephan well knew that lycanthropes were a common threat in the wilds of Karameikos, and immediately recognized them to be wererats. Behind those, two wild-eyed humans ran out ahead of a band of warriors. From the looks of them, they were the brainwashed cultists known as Hounds of the Iron Ring. Ten humans in chain, were commanded by a large fighter who Ludo recognized as Sligh, the agent that Golthar had dispatched earlier. Last was Jolenta. A tall woman with short hair and piercing blue eyes, she wore a blue cloak over chain and wielded a mace. Even as the enemy charged from the forest, silence still ruled the forest a byproduct of Jolenta’s enchantment as all the sounds of those around her were stilled. The unnatural absence ensnared the party all around, until the ratmen got further away Jolenta and their viscious snarls echoed through the night air. Maruc had considered casting his own silence spell toward Golthar, but the mage was flying out of range. Instead, his arm snaked out to steady his wounded friend. “Halav bless thee Miklos!” he cried, casting one of his precious cures. Next, he turned and raised his fist to the skies. “Flee if you value your treacherous skin, Golthar! We have what you seek, and we will burn it before you lay hands upon it!” Maruc’s gaze swept the moving bushes and he readied his flail and shield. “Thank you,” Miklos sighed. And then the wizard crept close to the sturdy cleric, gripping his staff, hoping he wouldn’t need it. The healing balm took the burning sensation away from his chest. The young mage’s eyes narrowed. But that he’d have had time to memorise another lightning bolt spell. He doubted a sleep incantation would work on a mage of Golthar’s power and he was at the limit for the range of a web spell. He glanced at the foes emerging from the bushes, and prepared a sleep incantation. He targeted it to where it would do the most damage, the middle of the group of charging warriors. Shields and swords fell all about as the entire force of ten fighters fell instantly asleep. Meanwhile, Feldard charged to take on the first of the two Hounds. Time seem to slow down and in slow motion he saw Feldard charge the attackers. As the first of Golthar’s crazed lackeys rushed in, the dwarf met his attackers head on. Stephan dropped his shield and readied his short bow. The mage was out of range, so he fired off two arrows at the large warrior that seemed to be the leader of the ground forces. He was not sure if one or both of the arrows he hastily knocked and shot were the enchanted ones he kept in the quiver with the others. Then, the ground attack was on. Stephan rolled, dropping the bow and retrieving his shield. The familiar sound of a quickly drawn sword reverberated in the dim wood as he engaged Sligh. Looking forward to how the story continues—and if you ever need an “old” D&D’er to help with the story, I’d be honored to step into the story—keep up the great work!!! “My turn.” he said in dark tones of death. His eyes met the cold blue of Jolenta’s. Imperceptibly he nodded at his foe. She, recognising the challenge smiled slowly. He wondered how prepared she was? Or whether she was spent. “Let us see.” he muttered to himself. “Halav constrain thee!” he cried and cast his Hold enchantment about the other priest. knowing that a powerful spell like this focused on one individual had the greatest chance of success. But also did he know that blessed priest were protected by their gods. Maruc had faith that no god could gainsay Halav Incarnate for he was present in the physical world and not separated by vast planes of space and time. His power was pure and immediate. Miklos nodded to Maruc, “No problem.” His eyes took in the charging were-beasts. “As yet.” he added. He wondered momentarily if a sleep incantation would work on Were creatures. “Interesting,” he said conversationally, “Homovermin-Lunus, in demi form if I’m not mistaken. Quite unpleasant don’t you think? Probably impervious to sleep and charm spells. Time for a web I think.” He spread his hands and raised his arms gathering the magic from the firmament. With force he thrust his web spell at the front ranks of the enemy. The dwarf had his mouth open as he charged the Hound, apparently bellowing something, but Silence stole his battle roar. Regardless of the lack of sound, Feldard swung at the crazed fighter. He wasn’t intimidated by the wild-eyed look of the seemingly bezerker human. No human, or elf for that matter, could compare to a dwarf when it came to a battle frenzy. Not that Feldard was anywhere near that state now. He could take these humans on without need of it. Ludo moved forward into combat, yelling …. and then everything went silent, one of Golthar’s spells he thought. He attacked the second Hound that was trying to flank Feldard, moving in he struck savagely with his sword and as the Hound parried, Ludo turned on his heel and used his dagger to cut deep into the Hounds arm. Stepping back he prepared for the Hounds anticipated counter attack. The battle din was unnaturally truncated. The sight of Sligh was made even more eerie in the silence. The hulking man bore the signs of many battles. He wore only a skull-cap helm which revealed the absence of his left ear; a gnarled lump of flesh, marked its former position. Sligh wore suprisingly little armor; his arms mostly bare and knotted with sinew. They fought. In the dusk. Leaves and sticks crushed beneath their feet made no sound. The melee took an erratic course as the two experienced fighters parried. Sligh knew something about fighting in the brambles. Turning, he hacked a leafy branch that cascaded into Stephan’s face. Without missing a beat, Sligh thrust his blade through the obscuring foilage delivering a nasty cut to the Traladarian’s shoulder. But Stephan knew the woods long before he knew the sword. He too had some tricks for fighting in the trees. Seeing a hefty, dead branch just overhead, he parried off Sligh and then struck the limb so it would fall on his opponent’s side. The ploy worked but didn’t garner more for Stephan than a good hack at Sligh’s right arm. Blood splattered his blade. Suddenly, the desparate racket of armed conflict erupted in Stephan’s ears. Sligh and the woodsmans’ dance of death had led them to the edge of the cone of silence. Twirling and spinning with sword and shield, Stephan was subjected to a startling sequence of noise, silence, noise, silence. The effect was sureal but Stephan was able to maintain a focus on Sligh who, equally, seemed to have no other interest in the world than Stephan. Until a diabolical grin spread across his face–snaggle teeth and all. Sligh spied something behind Stephan. But something struck Stephan from behind. Something was on his back. Something was biting his neck. Turning and twisting in a frenzy, Stephan grasped at the thing on his back. He felt a stinging pain in his neck and flailed into the foliage in frantic attempt to rid himself of the pest. Slight did not lose the opportunity and lunged forward at the stricken woodsman. Slicing down and across with his sword, the hulking fighter pressing the attack. Hasan watched the woods mans fight. It was evenly matched until the were rat interceded. Hasan saw Stepgan slump under the were creatures horrible bite. Finally the elf saw the clear shot he had waited for. The arrow raced forward and buried itself in Sligh’s upraised arm. It was a grievous blow, but the great man halted only momentarily before his battle cry rose again in the strange half quiet night.